This is a fun product for all of us who were never able to spend thousands of dollars on custom lighting systems for our home. It’s almost a dream come true for those who love the idea of remotely controlling the lights in each of the rooms of your apartment or house. iDevices Socket is wi-fi light bulb adapter that simply screws into a standard light socket. 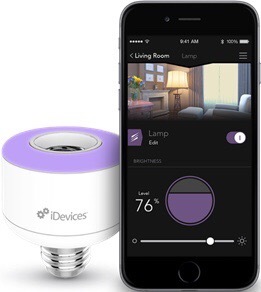 For $79.00, you can buy an iDevices Socket which will turn a standard bulb into a smart Wi-Fi bulb. The iDevices Socket interfaces with Siri and other wi-fi connected products. There may be other adapters like this on the market but the iDevices Socket also features dimming capabilities and a color light ring for ambiance. It can handle up to 60 watts. To find out more about iDevices, see the Dealerscope story on the product. This entry was posted in digital, senior lifestyle, tech and tagged iDevices Socket by loiswhitman. Bookmark the permalink. It truly is a good idea! Creating various effects enhances the home and affects mood. All for a few dollars!